Welcome to Oasis Agencies Private Limited, Go green to protect your environment. Manufacturer & Exporter of Eco-friendly Jute Bags. The company was incorporated in 1995, at Kolkata. Our State-of-the-art infrastructure, Cutting edge technology & High grade raw material make us stand apart from also-rans. We provide Premium quality products, Customized solutions and unparalleled customer service. Our diversified range of products include Jute Pouch, Wine, Shopping and Designer Bags. We offer Jute Shopping, Promotional & Beach Bags that are widely appreciated in the market. 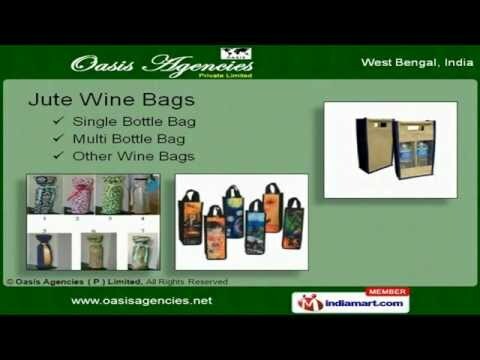 Jute Wine Bags are Comfortable to hold and are a perfect cover for any bottle of wine. Our Jute Fashion & Designer Bags are available in a variety of styles and patterns and add aesthetic appeal to the whole apparel. We provide Jute Christmas, Gift, Handmade & Children Bags that are Spacious, colourful and will match you college wear. Jute Pouch, Canvas & Cotton Bags are available with contrasting strings which perfectly complements the beauty of the craft.